Fig 1. SUPPA generates the different alternative splicing events from an input annotation file (GTF format). 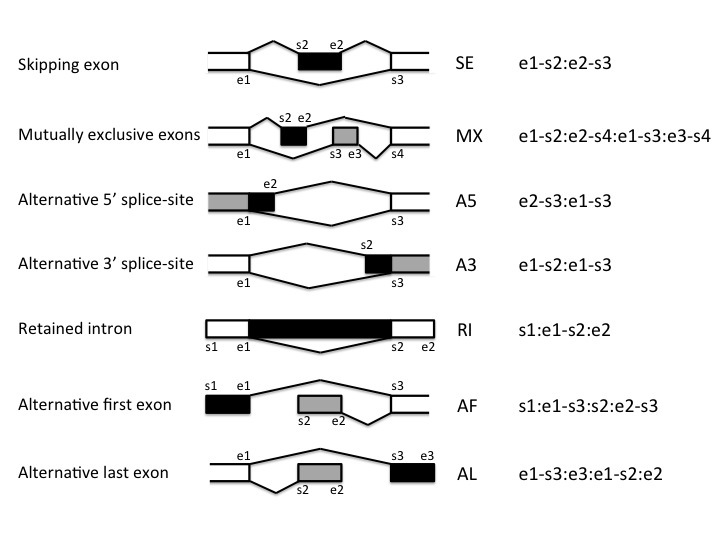 The method reads transcript and gene information solely from the "exon" lines in the GTF. It then generates the events and outputs an ioe file, which contains the for each event the transcripts that describe either form of the event. Specifically, it provides the transcripts that contribute to the numerator (one form of the event) and the denominator (both forms of the event) of the PSI calculation. For the generation of PSI values, SUPPA reads the ioe file generated in the previous step and a transcript expression file with the transcript abundances to calculate the PSI value for each of the events. Fig 2. (a) SUPPA calculates the magnitude of splicing change (ΔPSI) and their significance across multiple biological conditions, using two or more replicates per condition. Conditions are analyzed in a sequential order specified as input. (b) Statistical significance is calculated by comparing the observed ΔPSI between conditions with the distribution of the ΔPSI between replicates as a function of the gene expression (measured as the expression of the transcripts defining the events). Alternatively, when there is a large (>10) number of replicates per condition, SUPPA can apply a classical statistical test (Wilcoxon) per event (not shown in the figure). (c) Using the output from the differential splicing analysis, SUPPA can also cluster events with similar splicing patterns using a density-based clustering algorithm. We provide below detailed information on how to install and run SUPPA. Please join the SUPPA google-group for sharing your thoughts and questions (suppa-users@googlegroups.com). SUPPA has been developed in Python 3.4. If necessary, to install python3 we recommend to download from the official site ( https://www.python.org/downloads/ ) the corresponding version for your OS. SUPPA is ready to use. Once downloaded, it can be used directly from the command line. generateEvents : Generates events from an annotation. psiPerEvent : Quantifies event inclusion levels (PSIs) from multiple samples. psiPerIsoform : Quantifies isoform inclusion levels (PSIs) from multiple samples. diffSplice : Calculate differential splicing across multiple conditions with replicates. clusterEvents : Cluster events according to PSI values across conditions. SUPPA generates the different AS events from an input annotation file (GTF format). The method reads transcript and gene information solely from the "exon" lines. It then generates the events and outputs an ioe file. The ioe file provides for each AS event in a gene, the transcripts that describe either form of the event. Specifically, it provides the transcripts that contribute to the numerator (one form of the event) and the denominator (both forms of the event) of the PSI calculation. Fig 3. Each event is identified uniquely by a set of coordinates: The start (s) and end (e) coordinates for the different exonic regions involved in the event. The external coordinates of the event are only used for the RI, AF and AL events. The form of the alternative splicing event that includes the region in black is the one for which the relative inclusion level (PSI) is given. The gray area denotes the other alternative form of the event. For instance, for RI the inclusion level is given for the form that retains the intron. Fig 4. In case the option for variable boundaries is used -b V (see below), an user input variability (detault: 10nt) is allowed in some of the boundaries (indicated with grey arrows). For some even types there will be less coordinates defining the event, as some boundaries are not tested any more. 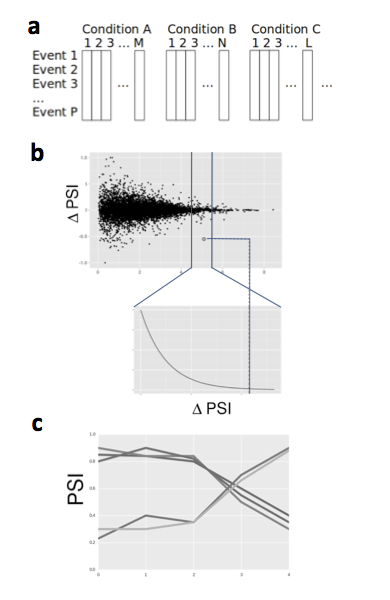 The variable boundaries (grey arrows) allow incorporating other transcripts contributing to the event, and therefore mimicking more closely the PSI calculate from RT-PCR primers. The events are still reported with the indicated coordinates. Those events that are redundant in this new setting will have the same transcripts contributing to the inclusion and skipping forms, however, they will be still reported in separate lines. As before, the form of the alternative splicing event that includes the region in black is the one for which the relative inclusion level or PSI is given, whereas the gray area denotes the other alternative form of the event. The generateEvents operation just uses the lines where the feature (column 3) is "exon". It then reads the different transcripts and genes. For that purpose "gene_id" and "transcript_id" tags are required in the attributes field (column 9). This command also generates a GTF file with the calculated events and with a track header ready to be uploaded into the UCSC browser for visualization (see below). -p | --pool-genes: pools together into a composite gene those transcripts overlapping in the same strand that share at least one splice site. An ioe file that shows the relationship between each event and the trasnscripts that that particular event. A GTF file (with a track header) to load into the UCSC genome browser to visualize the different events. <output-file>: -o option specified when launching the program. <event-type>: a two letter code referring to the event type (SE, A3, A5, MX, RI, AF, AL). event_id: ID of the event. Inclusion transcripts: IDs of the transcripts that define the form of the event for which we calculate the PSI (e.g. exon inclusion) and contribute to the numerator of the PSI formula. For more details see Figures above. Total transcripts: IDs of the all transcripts that define either of the two forms of the event (e.g. inclusion and skipping) and contribute to the denominator of the PSI formula. For more details see Figures above. <event-type>: correspond to the two letter code of the event from the following list. 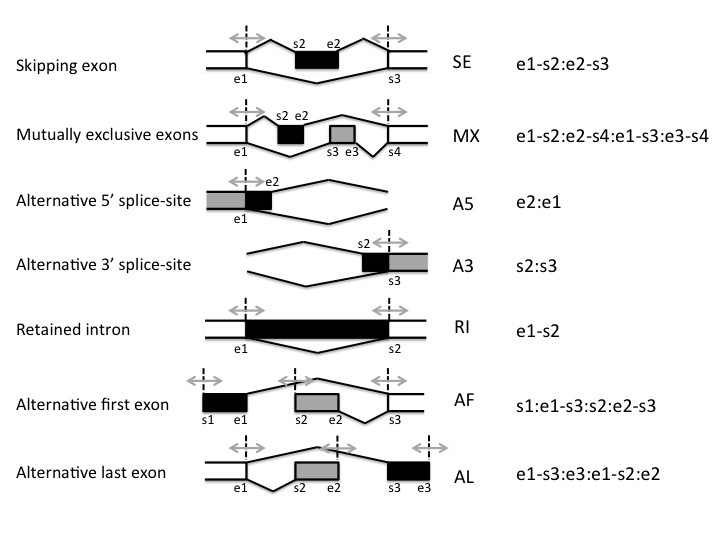 MX: transcripts containing the alternative exon with the smallest (left most) start coordinate. Total transcripts: The IDs must be the same as those provided in the expression (TPM) files. Total transcripts are the transcripts that define both forms of the event and therefore contribute to the denominator of the PSI formula. This output file is aimed for visualization and it is a regular gtf in half-open coordinate convention with a track header to be uploaded in UCSC. In this file, each of the two possible forms of an event is described as a separated transcript_id. Moreover, the gene_id is defined as the event_id. The -l | --exon-length option of the eventGenerator operation defines the length used to display the constitutive exons in the GTF file and it is used only for visualization purposes. For instance, in a Skipping exon event the flanking exons will be shown with a length given by this parameter. SUPPA reads the ioe file generated in the previous step and a transcript expression file with the transcript abundances to calculate the PSI value per sample for each of event. An ioe file and a "transcript expression file" are required as input. The transcript expression file is a tab separated file where each line provides the estimated abundance of each transcript (ideally in TPM units). This file might contain multiple columns with the expression values in different samples. The expression file must have a header with the naming of the different expression fields, i.e., the sample name of each expression value. -f | --total-filter: Minimum total expression of the transcripts involved in the event. If used, it will filter out the events that do not reach this total expression value for the transcripts defining the event (the denominator of the PSI calculation). -1: PSI = -1 if the expression is 0 for all the transcripts involved in the event or if the event does not pass any the transcript expression filter (see Psi calculation, Command and options). NA: PSI = NA if one or more transcripts of the event do not appear in the expression file. The output file is similar as for events, but where each line has the PSI of each isoform in every given sample. -i | --input-files: Space separated list of the files to be joined. -f | --file-extension Extension of the output file. Required. -o | --output-file: name of the output file. The output will look like an expression file with multiple files as described above. Important: Right now this method assumes that the individual files have in the first column the IDs that are common across all files, and in the second column the PSI or TPM values to be joined. This will be changed in the future to a more flexible method so that generic tab separated files can be used directly. 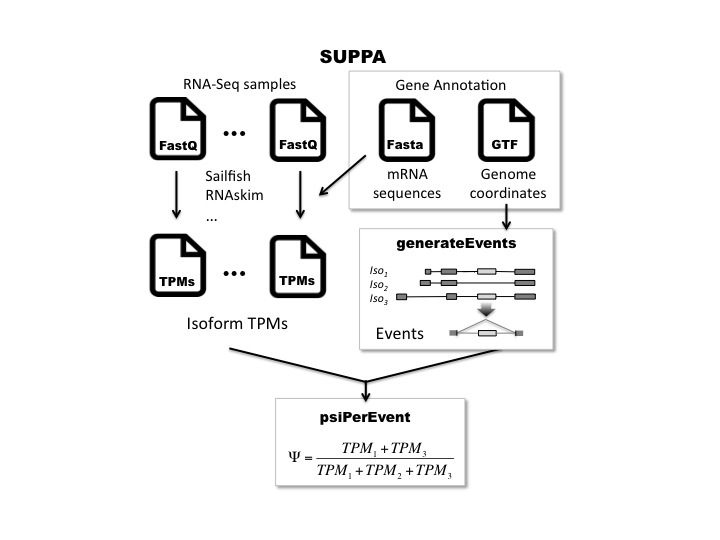 SUPPA reads the PSI and transcript expression values from multiple samples, grouped by condition, and the ioe file, to calucate the events that are differentially spliced between a pair of conditions. SUPPA can test multiple conditions with a variabe number of samples per condition. The ioe file, a PSI files and the transcript expression files are required. The PSI and transcript expression files are both tab separated files, where each line provides, respectively, the PSI values and the estimated abundance of each transcript. These files have to contain multiple columns with the PSI values and expression values in different samples, keeping the same ordering of samples in both files. where the expression values are ideally given in TPM units. Important: SUPPA will read one PSI file and one transcript expression file per condition. Each of these files will contain the multiple replicates (or individual samples) that are grouped into a given condition, and the should be specified in the same order within the files. -p | --psi: PSI files. The psi and expression files must be given in the same order. -e | --expression-files: Transcript expression files. The expression files and PSI files must be given in the same order. -a | --area: Integer indicating the number of points in the local area of the delta PSI - average TPM distribution. (Default: 1000). -l | --lower-bound: Lower-bound for the absolute delta PSI value to test for significance. Events with less than this delta PSI will not be tested. (Default: 0). -pa | --paired: Boolean. Indicates if replicates across conditions are paired. (Default: False). -gc | --gene-correction: Boolean. If True, SUPPA correct the p-values by gene. (Default: False). -al | --alpha: Family-wise error rate to use for the multiple test correction. (Default: 0.05). Note: ΔPSI values are calculated pairwise between each pair of adjacent conditions as provided, and calculating the PSI different between a given condition and the previous one. For instance, for three conditions 1,2,3, the ΔPSI values will be calculated for 3 - 2 and 2 - 1. The differential splicing operation generates a dpsi file and a psivec file. Cond1_Cond2_dPSI: Event PSI difference (ΔPSI) between Cond2 and Cond1. sample PSI: PSI value for a given replicate/condition. Using the PSI values in all samples, and the information of which events change significantly in at least one comparison, SUPPA calculates clusters of events using a density-based clustering. Density-based clustering has the advantage that it can put together into the same cluster two events that even though they might not have similar PSI values, their behaviour is similar across conditions and there are sufficient events between them with a similar behaviour. -d | --dpsi: Input .dpsi file generated from SUPPA diffSplice operation. -p | --psivec: Input .psivec file generated from SUPPA diffSplice operation. -s | --sig-threshold: p-value threshold to consider an event significant from the dpsi file. -e | --eps: Maximum (Euclidean) distance (between 0 and 1) to consider two events as members of the same cluster. (Default: 0.05). -n | --min-pts: Minimum number of events required per cluster. (Default: 20). Note: In the example above, the replicates 1,2,3 and 4,5,6 are grouped into 2 conditions. SUPPA cluterEvents operation generates a clustvec file per each pair of dpsi and psivec files. cluster_id: Cluster ID. An integer starting from 0 that indicates to which cluster the events belongs to. Singletons (non-clustered events) are indicated with -1.
cond_PSI_avg: (variable number of columns): Average PSI value for each condition. Note: The clustvec file doesn't contain a header. The header is for illustraion purpouse only.